Contemporary Jewelry in Perspective – Damian Skinner, curator of applied art and design at the Auckland Museum, discusses the fascinating world of contemporary jewelry. Using unique pieces, Skinner places the medium in a historical and cultural context. 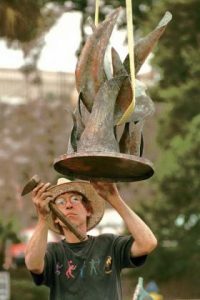 Renowned Blacksmith Ivan Bailey, a Georgia artist and teacher widely considered one of America’s greatest artistic blacksmiths, passed away at his farm in Monticello on September 9, 2013. Born in Oregon, Bailey entered a Christian Brothers’ monastery in Napa, California but left the novitiate to obtain a B.A. in art at Portland State University. He then studied at Penland School, North Carolina and received his MFA in 1971. A forge workshop with Alex W. Bealer, author of the seminal The Art of Blacksmithing and Bailey’s future father-in-law, altered the course of Bailey’s career forever. In 1972 he won a Fulbright fellowship but accepted a larger German cultural exchange grant to study for a year under Professor Fritz Ulrich at the Craft School of Aachen, Germany. Bailey’s original commissioned work is represented in hundreds of private and public installations and collections, including Savannah’s Olympic Torch monument. His many honors include the Governor’s Award of the Georgia Council for the Arts and the Georgia Association of the American Institute of Architects Award for Craftsmanship. He was a founding member of the Artist Blacksmith’s Association of North America. Bailey retired to Monticello, GA seven years ago. Bailey led an exemplary life, as an artist, a father, and a grandfather. I have always admired SNAG for its unique mix of critical thought and useful knowledge sharing. I truly felt It would be both challenging and rewarding for me to work with this important organization. Michelle Pajak-Reynolds had a jewelry presentation at the Pro Football Hall of Fame’s 50th Anniversary Enshrinement Festival Fashion Show. She was featured on FashionMingle.net about her debut as the first independent designer at the show. Rebecca Rose is the winner of this year’s Halstead Grant for design excellence and business strategy acumen in the silver jewelry market. 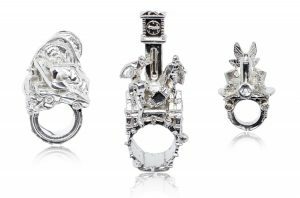 She recently returned to the jewelry studio to launch her line of “Sculpturings.” The cast rings are sculpted from found object components and original elements to interpret social issues or current events. Creations are named by pairing relevant words with the word “ring,” usually as a suffix. Sarah Turner has accepted the newly-created position of Dean of Cranbrook Academy of Art. In her new role, Turner will oversee academic programs and partnerships, and provide support to the Academy’s 10 studio departments. She will also continue to oversee enrollment services and the Academy’s support departments. Aleksandra Vali’s work “Revel of Bile and Envy” was selected to be presented in the book 500 Art Necklaces by Lark Books. And “Jewelry Boxes – Beauty is Inside” is included in 500 Paper Objects by Lark Books. San Diego State University MFA students Alexandra Hopp, Amanda Packer and Demitra Thomloudis’ work was exhibited in the juried Graduates Exhibition at Galerie Marzee in The Netherlands. Hopp and Packer were two of eight international recipients of the Marzee Prize for 2013. SNAG would like to take this opportunity to recognize our Corporate Members for their support: Facèré Jewelry Art Gallery, Jewelers Mutual Insurance Company, K.M. 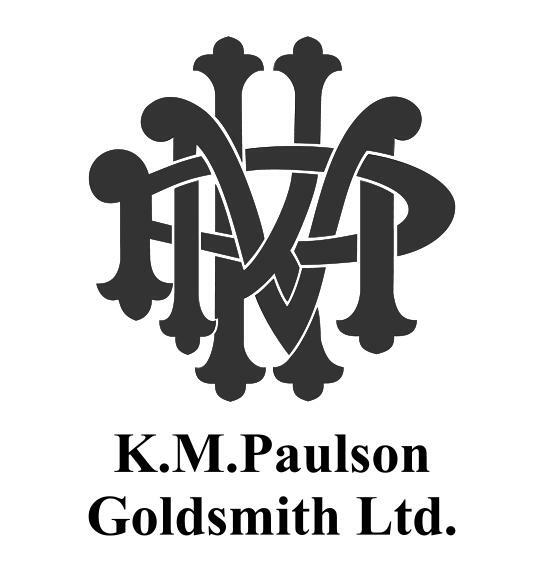 Paulson Goldsmith Ltd., and Tim Roark Imports.